Today is the third anniversary of my father’s death. Each year, this day becomes a little easier, but I suspect there will always be something that is sort of raw and painful about anniversaries like this. I recently found the eulogy that I wrote and read at his service. One of my friends was working on one for her own father, and asked if she could see mine for inspiration. I had to go back to an old computer to find it. I had not read it since the day I delivered it at his service. I decided to reprint it here today, on this third anniversary, well, just because it feels right to do something to acknowledge this day. In going back and reading it now, I realized that his story is also my story. This is really how I came to be – the person I am today – good, bad and indifferent. For many of you, you knew my dad as that funny guy hanging out at the bar, playing dice, laughing and cracking jokes. Or as the caretaker of the school, or as that man who walked his cute little dog around town. Or, you may have known him as a “laugh a lot person” – the description that my kids have for him. My dad was all of those things but much more. He almost never talked about himself, so I wanted to share with you today a little background about his life. My dad was born in Olean, New York in 1939 as Arthur Ellison Doyle the second. He was a junior, but they just called him Artie. He was born to parents who were told they could never have children, so there he was…surprise. At the time he was born, his parents were in their early 40’s. And although now we see that 40 is actually young, at that time, that was really, really old to be having children. Unfortunately, his mom died due to complications from childbirth with his sister – Diane, who is two years younger than my dad. After that, my dad lived for a short time with his grandparents, then his Uncle on a ranch out here in California, but then when his father remarried, he went back to NY to live with his dad and stepmother. Shortly after he moved back though, his father died and then he and his sister were orphans. Fortunately, he and Diane were adopted by his Aunt Avenil, who really was the parent who raised him. After his turbulent early years, my dad enjoyed a normal childhood raised by a loving mother. He was a natural athlete and ended up being a football star, basketball star, and overall big man on campus in high school. His mom thought his ego was maybe a little too big and decided the best thing for him after high school was to head off to the air force. It was during his service time that he met my mom. They were married in 1962 and settled in the Bay Area. My dad went to college after the air force and completed his bachelor’s degree from San Jose State. My parents worked, traveled, and bought their first house. They must have enjoyed the newlywed lifestyle a lot because it was eight years before they decided to start a family. First me, then my sister five years later. By then, we lived in Danville and my dad had a good job at Lucky Stores that supported our family. We lived a typical suburban lifestyle – nice house, new cars (my dad loved cars and it seems to me like we had a new one every year). We lived in a great suburban neighborhood. It was all nice and good, but not ultimately, my dad’s dream. We came camping up to Bear Valley one time and I think he was hooked. Next thing I knew, we sold our house, my parents quit their jobs, and we moved up to the mountains of Bear Valley to build a house – yes build it ourselves. Crazy now, for me looking back to imagine how my dad and mom had the guts to do that. I think my dad thought he was going to live out life up here as a successful stock market investor. The market, though, had different plans. So my dad went back to work and began the job at Bear Valley School. He worked there until his retirement in 2005. At Bear Valley, he was the stable icon of the school. As teachers and teachers aids came and went, my dad was there, helping to raise and transport the school children in Bear Valley for over 25 years. In retirement, he enjoyed golfing, walking dogs at the humane society (where he found little Fang), spending time with his grandchildren and playing cards and games with his new buddies at the Diggins. Going through his things these past few days, we found a first place trophy from the 8-ball pool tournament at the Diggins last year. I was laughing to my sister – of course dad won the pool tournament, would you expect anything else? My dad was always competitive and loved to win. Although he was a great father who would do almost anything for me, letting me win was never part of his parenting strategy. I really can’t remember ever beating him at any game – Monopoly, cards, dice, chess, darts. Even playing basketball or baseball – every game he won. When he was staying with us during his last few weeks, I convinced him to play some games with us. And of course, he still won. My son is a master at Connect Four. Still, I sat there in amazement as my dad beat him time and time again, smiling after each win – competitive to the end. But when it really counted, in his relationships with people he loved, he was the ultimate giver, not a competitor. If I could sum up my relationship with my dad in one word it would be “easy”. It was just easy to be his daughter. Not easy because I was an easy daughter – if you knew me in my younger years you know that to be true – No, it was easy because he was such an easy going dad. His love was unconditional. Even if I did something wrong or we disagreed (although after my head-strong teenage years, I’d be hard pressed to even think of a disagreement), I knew that my dad loved me and accepted me and never would hold a grudge or hold anything over my head. During my pre-teen and teenage years, after my parents divorced, I lived with my dad. He basically raised me through all the teenage angst and drama. Really, looking back now, I can’t believe it. What an amazing thing that he did to provide me with that stable home during that turbulent time. And the sacrifices he made – moving to Arnold so that I could be closer to school and didn’t have to ride the bus so far – which meant that he would have to drive much longer and get up in the early morning hours to drive to work. But he did it for me – and I never once heard him complain. Then, he fully supported me going away to school and helped pay for college – and only now going through all his old paperwork do I see the loans he took out to do it. Again, never making me feel guilty or even sharing the sacrifices he made. Which, looking back, I don’t even think he thought were sacrifices. He just wanted me to succeed and to be happy. He always made sure that my sister and I were taken care of, even if he had to sacrifice. For most of my life, my dad gave to me. I was happy that as I got older, I was able to do for him – to give him gifts that I knew he would never buy himself or experiences that he would not have otherwise. He was truly the most grateful and easy person to buy and do things for. He was appreciative of everything and particular about very few things. During his last weeks, when I was caring for him, I really thought that I was giving to him at that time. Now, in retrospect I see that really, those weeks were a gift that he gave to me. That is time I never would have had with him and I will cherish it for the rest of my life. And it wasn’t just a gift to me, it was for my husband and children too. We had some great quality time that we were able to share with him that we would not have had. He mentioned to me a few times during his last weeks, “If anything happens to me, just tell everyone I lived a good life and I did pretty much whatever the heck I wanted to do.” So, I told them dad. That is true and just what you did. For years, he had this cartoon on his refrigerator. I pulled it off the other day because I think it’s so telling of my dad and speaks his truth. So if there is one thing that I have learned from him is to live life with no regrets. I plan to take that to heart and it’s another gift he has left to me. I certainly have no regrets when it comes to my relationship with my dad. It is something that has shaped me to become the person that I am and will always be one of the most important relationships of my life. 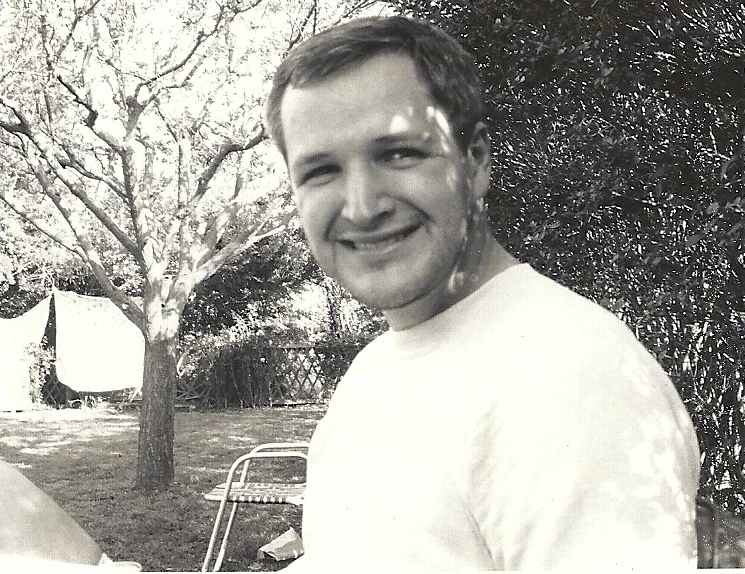 My dad was a man who enjoyed the simple pleasures of life – a great hike, a good book, a cold beer, a laugh with friends. His was a life about relationships and not about things. I will miss him so much but I am so appreciative that I had him in my life for as long as I did and he helped shape the person I am today. Dad, I love you, I will miss you and may you rest in peace, with a cold beer in one hand and a great hand of cards in the other – with that big smile we all love creeping across your face. Posted in Loss and Grief and tagged anniversary, dad, death, eulogy, father, grief. Bookmark the permalink.